At STI, we make motocross tires because we believe we can do it better. We race, we ride, and that’s why we make great tires. It’s a lot like the motivation behind REM Saturday Motocross in southern California. “We started REM because we knew racing could be better,” is how the founders say it. That’s why we’re proud to say that STI is the Official Tire of REM! 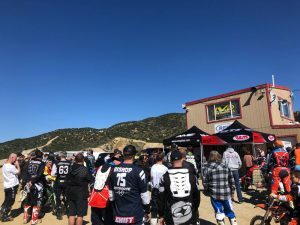 REM Saturday Motocross is enjoyed by hundreds of racers on 29 Saturdays in 2019; the race series began in 1986 at Carlsbad Raceway. Races take place mostly at the famed Glen Helen Raceway in San Bernardino, Calif., but also at Cahuilla Creek MX. Some of the nation’s top pros have competed at REM, as have many first-time racers. “The core of REM is the racer who wants to race motocross every week, be challenged, hang out with good people, and be home in time to take their significant other out on Saturday night;” that’s from the REM website. And it’s true. We know, because we do just that. The STI Tech 2 and Tech 2 PRO tires are made in the same spirit. Check us out next time you’re at REM Saturday Motocross. See you at the track.